We are all familiar with oil, in one form or another, in all aspects of our daily lives. We use it for cooking, heating, lubricating, and in a thousand and one other ways. Without it there would be no industry, no transport, and we would have to do without many of the 'plastic' goods we take for granted. Oil has always been the 'life-blood' of society, a fact that the Jewish people of the Old Testament were very aware of. The oil which the Jews knew, and which is still in use today, is olive oil and it is the same oil which we use in Church. For the Jews a plentiful supply of oil, along with corn and wine, was a sign of God's favor. Oil was, and still is, a sign of God's blessing because it represents all that is best in life, God's generosity to the people He loves. We use oil in Church in two ways: we sometimes burn it in votive lamps, and we anoint people with it. In both cases its use can be traced back to the earliest times, and is recorded in the Old Testament and the New. The Christian Church adopted the use of oil from both Jewish and pagan practice very early in its history. Anointing with oil largely fell from favor in the Church of England for several hundred years. However, its importance in recent times has been rediscovered there. In the United States, and specifically in the Anglican Catholic Church, it has its proper place in the Sacraments of Baptism, Confirmation, Unction, or the anointing of the sick, and in the Ordination of priests. Oil as a symbol reminds us of God's boundless generosity towards us, and of His never-ending love of us. When we use it to anoint people in Church, it is more than merely a symbol, or reminder. It becomes one of the channels by which God's power comes into the world, by which He blesses us with His Holy Spirit. The oil is essentially no different from any other olive oil, but it is made special by being set aside specially for God's purposes. God takes the ordinary things of this world, in this case olive oil, and makes them holy. He works through material things to show Himself to the world and to bring people back to Himself. In the letter of St. James (5:14) we read, "Is any among you sick? Let him call for the elders of the church, and let them pray over him, anointing him with oil in the name of the Lord, and the Lord will raise him up." The rite of anointing the sick in mind or body, those about to undergo surgery, those nearing death, is one of God's gifts available to His people through His priests. This kind of anointing is itself a Sacrament. Those who receive it can be confident that God will respond to the prayer of faith. Holy Chrism is the oil used to anoint people at their Confirmation, and is also used to anoint priests at their ordination. 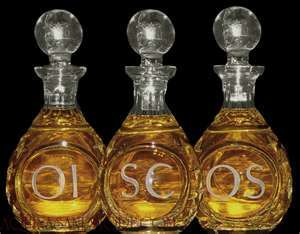 It is also used in the consecration of altars and Church buildings. In the A.C.C. it is additionally used by bishops when they consecrate chalices and patens. 'Consecration' means making holy or setting apart for God's purposes. It differs from the other two oils in that it alone is not pure olive oil. A scented balsam is mixed with the oil to make the Chrism. The oil is almost always applied using the right thumb, or occasionally is poured on. When applied with the thumb, it is usually applied in the form of a cross*. This is to remind us that all blessing come from the crucified Christ, the source of all healing and life for the world. When anointing accompanies Baptism, the cross is marked in oil on the baptized person's forehead. In this way they are 'sealed' with the Holy Spirit as a reminder of Revelation 7:3 in which the servants of God are "sealed . . . upon their foreheads." In Baptism we are made servants of God. Confirmation candidates and the sick are anointed in the same way on their foreheads, and for the same reasons. The sick are also anointed, as the need arises, on the infected part of their bodies. In this way their prayer is acted out. In the Sacraments of Confirmation and Ordination the anointing is in addition to the action of "Laying-on of Hands'. In the Sacrament of Unction the anointing with prayer is at the heart of the rite, and although accompanied by the 'Laying-on of Hands', is itself the essential element. As with all things Christian, God chooses the ordinary things of this world, and by His Grace makes them extra-special. He then uses them to make His presence felt in the world. His does this when through the Holy Water of the Font He gives new and eternal life to His people. His does this supremely when He takes the bread and wine at the hands of a priest and returns them as the Body and Blood of Christ. He does this when, by the means of Holy Oils, He pours His healing and life- giving Spirit into the Church and upon her members.